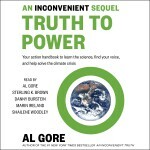 Former Vice President Al Gore, Shailene Woodley, Sterling K. Brown and More To Narrate the Audiobook Edition Of An Inconvenient Sequel: Truth To Power | News and Corporate Information about Simon & Schuster, Inc.
News and Corporate Information about Simon & Schuster, Inc.
NEW YORK, July 11 – A star-studded cast of narrators will join former Vice President Al Gore on his forthcoming audiobook AN INCONVENIENT SEQUEL: TRUTH TO POWER, available on CD and for download on July 25, 2017. The Simon & Schuster audiobook will be published simultaneously with hardcover and ebook editions from Rodale. A documentary film of the same name will follow later that week. Golden Globe–nominee Shailene Woodley (The Fault in Our Stars, Divergent), Emmy Award-nominee Sterling K. Brown (This is Us; The People v. O. J. Simpson: American Crime Story), Tony Award winner Danny Burstein (Fiddler on the Roof; South Pacific) and Tony Award-nominee Marin Ireland (Glass Chin, Homeland) will all lend their voices to the audiobook edition. In AN INCONVENIENT SEQUEL: TRUTH TO POWER, Gore recounts and contextualizes the critical issues and moments in the climate change movement since the release of An Inconvenient Truth more than ten years ago, and highlights the real solutions we have at hand to change the planet for the better. The audio edition of An Inconvenient Truth won the Grammy Award for Best Spoken Word Album in 2009. ABOUT SIMON & SCHUSTER AUDIO: Simon & Schuster Audio is a leading publisher of general interest audiobooks including bestselling fiction, nonfiction, business/finance, self-improvement, inspiration, language learning programs, original audiobook productions, and children’s titles. In addition to a list that includes such unparalleled authors as Mary Higgins Clark, Vince Flynn, Ernest Hemingway, Stephen King, Michael Lewis, and David McCullough. Simon & Schuster Audio has produced audiobooks that have won eight Grammy Awards and earned forty-two Grammy nominations since 1989. For more information about Simon & Schuster Audio, visit our website at www.audio.simonandschuster.com. SIMON & SCHUSTER, a part of CBS Corporation, is a global leader in general interest publishing, dedicated to providing the best in fiction and nonfiction for readers of all ages, and in all printed, digital and audio formats. Its distinguished roster of authors includes many of the world’s most popular and widely recognized writers, and winners of the most prestigious literary honors and awards. It is home to numerous well-known imprints and divisions such as Simon & Schuster, Scribner, Atria Books, Gallery Books, Pocket Books, Touchstone Books, Adams Media, Threshold Editions, Simon & Schuster Children’s Publishing and Simon & Schuster Audio and international companies in Australia, Canada, India and the United Kingdom, and proudly brings the works of its authors to readers in more than 200 countries and territories. For more information visit our website at www.simonandschuster.com.